Here we present two totally different posts, both written by Chris Hague, Guideline Power Team UK. This season he travelled to Iceland and West Ranga river but also fished much closer to his home in the River Derwent at Chatsworth House. Very different settings and fishing, but as we all know – It’s all about the experience. Iceland – West Ranga river. 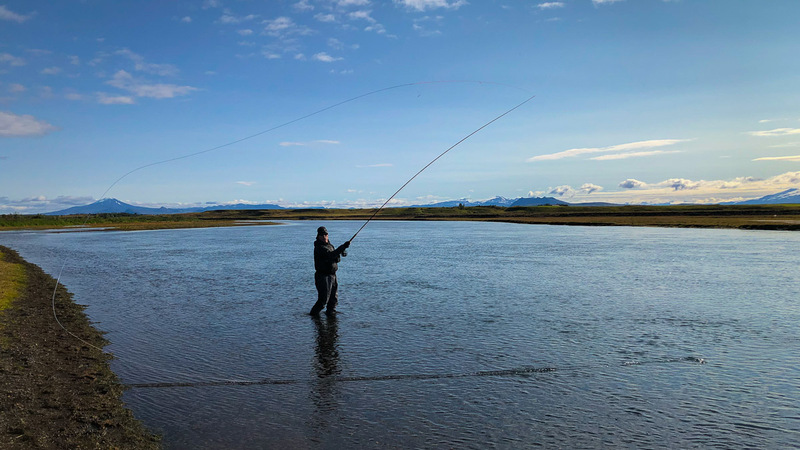 I have just returned from a trip to Iceland where I fished the West Ranga river. We stayed at the Laxa lodge which I can only describe as outstanding. It’s the best lodge I have visited by a country mile. The facilities were first class with a huge drying /rod room, first class bed rooms, and an excellent bar area and restaurant which over looked the stunning river. The catch rates have been poor this year but they are still well in front of the waters in the UK. I was also really impressed with how they do everything possible to maintain /increase their Salmon population. In my opinion the UK should try and implement some of their ideas to increase our population of Salmon. The river was amazing, crystal clear with a strong flow to it which made it an ideal fly water. The clarity of the water made it easy to sight fish which came in handy as the Salmon were very rarely seen bouncing about on the surface as we often see them in the UK, they always seemed to be low in the cold water and the takes were more like trout takes, they appeared to be hoovering the fly off the bottom and you often just felt a tug and release like trout do. I combated this by extending my plastic tube on my tube flies to push the hook further back then on any short takes I had a chance of hooking up, this seemed to work a treat. I used three different setups on this trip. Guideline NT8 13 ft 9 inch 9/10 w multi piece travel rod with a Haze V2 reel and the 4 D line, which I think is the best Salmon line on the market at the moment. I did the bulk of my fishing with this rod and the setup is awesome for anybody interested in buying a new outfit. The line is very versatile as it comes with a selection of tips with a variety of different sink rates which allows you to quickly adjust depth control by just changing a tip. The other great thing about the line is it sinks in four different densities meaning only your tip is bouncing the bottom not the full line. Guideline LXI 11ft 6 inch 7/8 w multi piece switch travel rod with a Haze V2 reel and a self made shooting head. This setup I used in tight spots when I wanted to fish a lighter presentation. Guideline NT8 10ft 7 w multi piece travel rod with a Vosso reel and the ULS multi tip line. I fished this system when I wanted to go super light or fishing from the bank. My guide also had me casting up river bringing the fly back over the fish with this setup. Big thanks to Jim Curry for the heads up on this line as it works superb, again it comes with a variety of different sink tips which makes it super versatile. The trip was amazing and I have been lucky enough to be invited back next year by Jon Ingi Agusstson who organised the trip. A big thanks to our guide Bikiri Mar Haroason who did everything possible to put us over fish. I can’t wait to return. Full image gallery further down on this page. The River Derwent at Chatsworth House. My favourite stretch of water for Trout and Grayling fishing in the UK has got to be the river Derwent that runs through the grounds of Chatsworth House in Derbyshire. It’s not just the fishing, it’s the surroundings that makes this place so special, with the magnificent house in the background and the wealth of wildlife it is home to. It is the whole package that makes this a special place to fish. You can often be fishing in the river when wild deer will go across the river so very close to you. It’s amazing things like this as well as the fishing that makes you want to come back at every opportunity. The river has wild Brown Trout, Rainbow Trout, wild and stocked, Blue Trout which can only be described as Rainbow Trout on steroids as they fight so hard. There is also a good head of Grayling and some Chubb, but these tend to be only around the one to two pound size, where there is some trout around the seven pound mark which can be great fun on light weight tackle. I often fish here and recently I invited Jim Curry head of UK sales for Guideline down for the day and we had a blast. We both fished French leader on the Guideline Fario Classic rod 10 ft 3 weight with a Fario reel in the morning and we both had great success with this system bringing all of the above species to the net between us. This Fario Classic rod is so sensitive you can tell when a fish breathes on your fly, it is a super rod. You can only fish a single fly on this stretch of the river and the copper beaded PTN with a red flash did the bulk of the damage for me in the morning. In the afternoon dry flies started to come off and we both switched to a different set up Jim using the LPXE 9 ft 3 weight with a Fario reel and line, I used the 9 ft 4 weight Elevate rod with a Fario reel and the GL 4 cast line. Jim had great success using a Mayfly pattern. The stretch I was fishing the fish did not appear to know what they wanted. I used a variety of flies Klink hammer, Griffiths Gnat, May fly patterns and Double Badger all working at some point in the afternoon, I also switched back to the French leader again with good results. It was a fantastic day with great company, I am now looking forward to my next visit soon. This place just draws you back, it has a charm about it that you never tire of. Written by Chris Hague GL Power Team UK.